What a beautiful book! was my initial response on opening this book. Like Alice in Wonderland’s sister, I am accustomed to my colonial biographies arriving without pictures or conversations, and if by chance there are pictures, it is usually a set of black-and-white pictures inserted in two or three places in the text. But this book is a well-bound hardback, complete with ribbon place-keeper, with a coloured and gold-embossed dusk-jacket that envelopes an even more beautiful cover underneath. It shows Conrad Marten’s painting of the landscape surrounding Elizabeth Bay House, built by Alexander Macleay, and possibly the best known association that many of us have with Macleay today. The fly-leaves of the book are patterned with thistles, reflecting Macleay’s Scottish origins, and the book is replete with vividly coloured photographs. The book has many of those features that publishers seem to begrudge these days: footnotes AND a bibliography, index and timeline. I’m not accustomed to such luxury in my history books, although two other recent beautiful publications in Australian History spring to mind: Grace Karsken’s The Colony and Bain Attwood’s Possession. But both these books, written by noted and established historians, dealt with the founding of the two largest cities in Australia, and while being strongly academic texts, could be expected to- and did- attract a broad readership and both garnered significant history awards. Who, I wonder, is the audience for this beautiful book? Alexander Macleay (1767-1848) was born in Scotland and did not arrive in Australia until 1826 at the age of 59 to take up the position of Colonial Secretary, alongside the new governor Ralph Darling. By this time, he had a large family (17 children!- although only 10 survived to adulthood) and he was accompanied to Sydney by his wife and six daughters and an extensive private collection of insects and objects from all over the world. As Secretary of the Linnean Society in London, he had contacts with scientific boards and their gentleman collectors across Europe, and his interest in botany and natural history continued in NSW where he not only served as patron of the fledgling societies established amongst the colonial gentry here (including the Museum and the Botanic Gardens), but also maintained his networks with the natural history community back home. His daughters married into the colonial elite of Sydney society, and his home Elizabeth Bay House was noted for its extensive and exotic gardens, through which he introduced many plants into Australia, including the wisteria. His close association with Governor Darling meant that he had to share the increasing acrimony directed at Darling, and his career ended ambiguously and unhappily under Governor Bourke, with whom he never established the same rapport. However, with the granting of a limited degree of self-government in 1842, Macleay offered himself for election to the Legislative Council where he was voted Speaker, a position in which it was acknowledged, even by his political opponents, that he served well. But despite (and perhaps because of) the rapid accumulation of land, he fell victim to the widespread depression of the 1840s, and was forced to move from his Elizabeth Bay House, estranged from his eldest son William who had taken over his finances. His scientific collection was eventually transferred to the Macleay Museum at the University of Sydney, where it still rests. 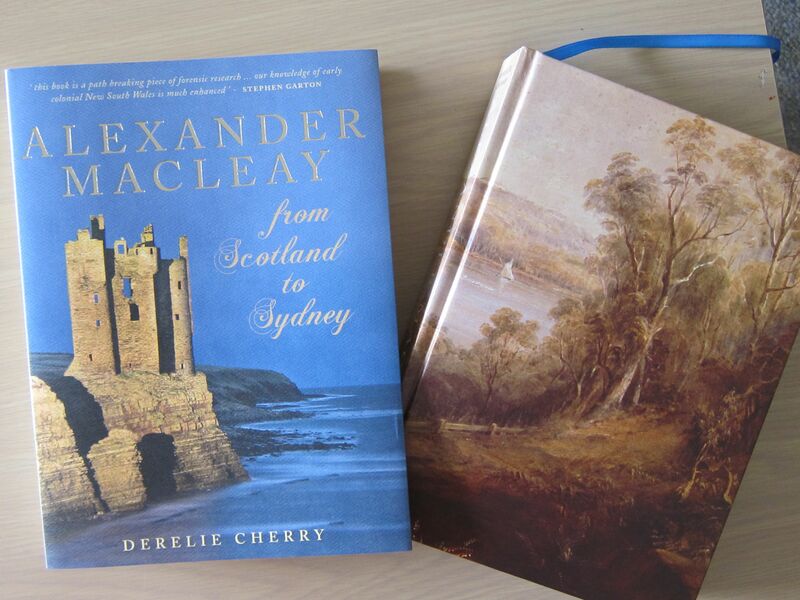 So which of these aspects of Alexander Macleay- civil servant,father, naturalist and collector, owner of one of Sydney’s grandest colonial homes, patron and politician- might attract readers to this book? A well-rounded biography would incorporate all of them, of course, but an insightful, scholarly biography would do more than enumerate achievements: it would also mount an argument about the individual that is woven into a broader approach to a society, a movement, a time. The approach that a book is adopting is usually foreshadowed and shaped in the introduction, which in this book takes the form of a literature review, emphasizing that this is the first comprehensive biography of Alexander Macleay and questioning in particular the depictions of Macleay in the works of Stephen Roberts and Manning Clark. The author takes up where an earlier researcher into the Macleay family, Annabel Swainston, left off, citing frequently from Swainston’s papers which are now placed in the Macleay Museum. Reading as an historian then, I found myself wishing that she would move back from her subject, and integrate her observations into a broader scholarly context. Macleay is a prime example of the collector-networker described in the work of Zoe Laidlaw and Lambert and Lester, and yet this whole approach to empire is largely invisible. Macleay’s prominence as a conservative is noted, but not taken any further. A large portion of the book is devoted to Macleay’s gardening and horticultural significance and yet the work of Katie Holmes and others about the meaning of the colonial garden is nowhere to be found. The blurb from Professor Stephen Garton from the University of Sydney describes her work as a “path breaking piece of forensic research”, and “forensic” is exactly the right word to describe this very close-up, detailed analysis. However, I found myself craving a bit of distance, and a broader sweep that pointed out the ways in which Macleay was acting as a man of his time and place, and where, if anywhere, he was distinctive. Having said that, though, her description of the Colonial Secretary’s office was illuminating, bringing to life the men behind the different scripts that you note in reading the primary sources, and her analysis of the financial entanglement that so damaged his reputation was insightful. What, then, of Macleay’s activities as collector and horticulturalist? In these sections, the fine-grained approach serves her well, resonant of the painstaking minutiae of the collecting and classifying mindset. At times, however, the detail and connections seem rather laboured and indulgent: a glorious photograph of a dahlia from her garden that Alexander “would have been among the first to grow” and sweetly-scented stocks that the Macleays “certainly would have included” in their garden, perhaps moves the book towards the ‘significant garden’ market. Given the prominence of Elizabeth Bay House as one of the foremost homes overseen by the Historic Houses Trust in NSW, I found it strange that the house itself played a minor part in the book if it is directed towards the gift-book buying public who may have visited the house, or those who may appreciate the importance of Elizabeth Bay House amongst our colonial architectural heritage. And so, I find myself somewhat confused over how to appraise this book. It is a close-grained biography that could have benefited from more distance and a broader sweep. It is also a particularly beautiful publication, that reflects no doubt the author’s experience in publishing over many years, and her own love of gardening and her family connection with Paradise Gardens and Nursery in Kulnura, west of Gosford. The combination of the two is rather puzzling- appreciated, but puzzling nonethess. This entry was posted in Australian history, Book reviews, Colonial biography. Bookmark the permalink. Thanks for the review Janine. I tried to go to Paradise Publishing, but the link you gave didn’t work. I’m really enjoying your selection of nonfiction. Are you counting this toward your Australian Women Writers Challenge? I wasn’t intended to count it. There’s other non-fictions with a more generalized appeal that I’m looking forward to reading (one day this year!) and putting towards the AWWC. Any reviews are welcome, of course, but it’s the more obscure, so called “weighty” tomes that don’t, arguably, need to be put on the radar most. Adding a link to your review on the AWW challenge page might just make it available to some curious person looking for serious reading. On Twitter the other day, a local author said she doesn’t read female authors because they don’t tend to write nonfiction. Clearly, there is still a question of perception among readers that women’s writing is light weight. I’m hoping the AWW challenge can help to change that perception.